After operating for nearly 40 years, this Queen Street institution closed its doors in 2014. Earlier this year, Peter Pan (@peterpanbistro) reopened after an extensive renovation under new ownership who wanted to preserve the name of the restaurant. There’s a lot of history in the original restaurant – most notably, Susur Lee worked there back in the day. Upon entering the restaurant, it’s obvious a lot of time, money and effort was put into the beautiful space. The restaurant is very spacious with incredibly high ceilings. The dim lighting in the evening gives it a very intimate feel – perfect for a date night (or a double date night, in our case!). 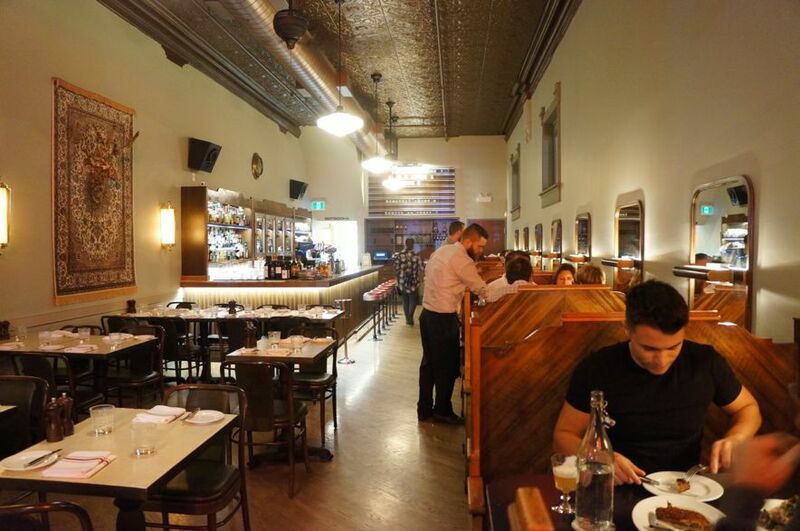 Cozy wooden booths line one wall and a long marble bar is featured down half of the other wall. During the renovations, they tried to keep as many of the original fixtures as possible like the tin roof, wooden booths and bar stools. 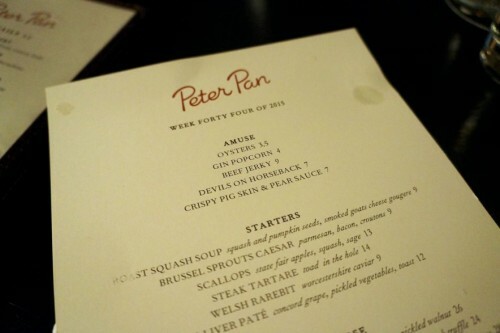 The revamped Peter Pan is owned by Executive Chef Noah Goldberg from the Feasting Room, a pop-up restaurant in the Orbit Room on College Street which featured nose-to-tail tasting menus. 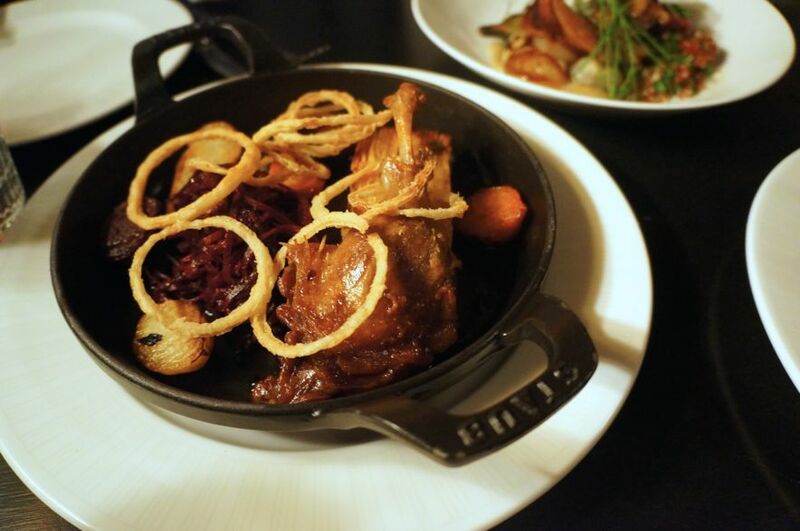 The nose-to-tail philosophy has carried to Peter Pan, so don’t be surprised to expect a few unusual animal parts to pop up on the menu. 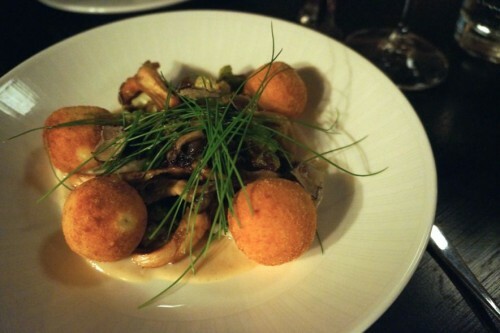 While there are a few mainstays, the menu changes weekly. The dishes seem to contain many British and French influences but are prepared in a more contemporary manner. The menu is broken down into ‘snacks’ ($4-$10), ‘starters’ ($9-$15) and ‘main courses’ (most hover around the $25-$30 range). The four of us dropped by on a Wednesday evening and we were pleasantly surprised that on Wednesday nights, they feature a selection of wine bottles for half price! We definitely took full advantage of it. 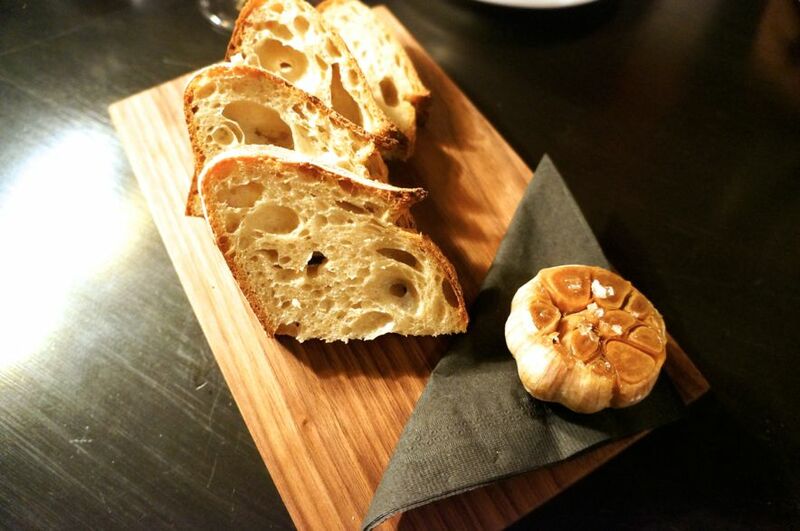 Our meal began with some Complimentary Bread – with roasted garlic. I loved the fact that they paired their bread with roasted garlic instead of butter. The garlic was so soft that you could spread it onto the sliced bread just like butter. I need to start doing this at home! From the ‘snacks’ section of the menu, we ordered the Gin Popcorn ($4) which was a nice little snack to nibble on. 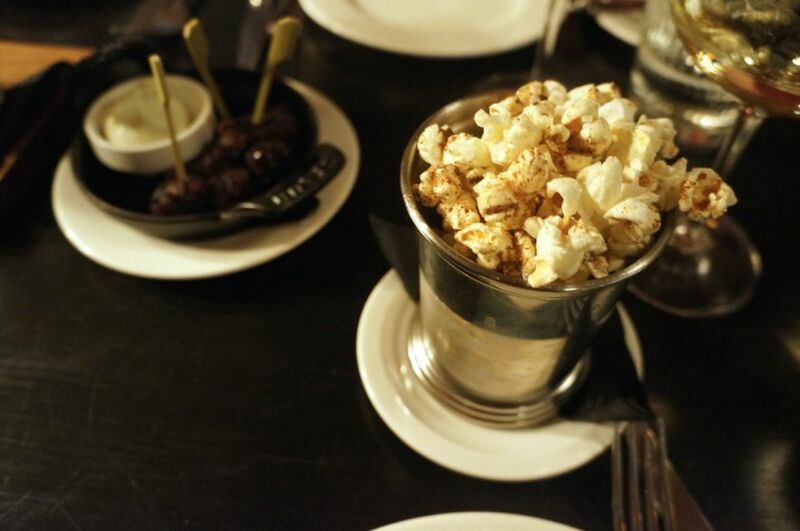 The popcorn here is flavoured with juniper berries which gives it a distinct gin flavour. 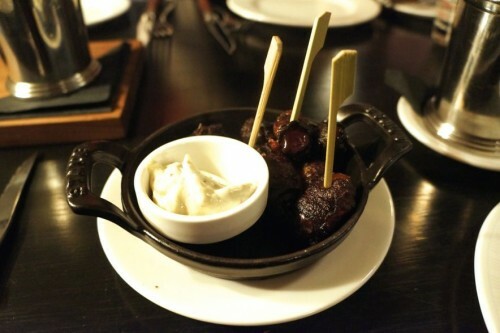 Another snack we ordered was the Devils on Horseback ($7) aka bacon-wrapped dates. I can never resist ordering this when I see it on a menu and these didn’t disappoint. Salty bacon wrapped around a sweet date and stuffed with cheese – delish! They also serve these with an aioli for dipping but I didn’t find it necessary. 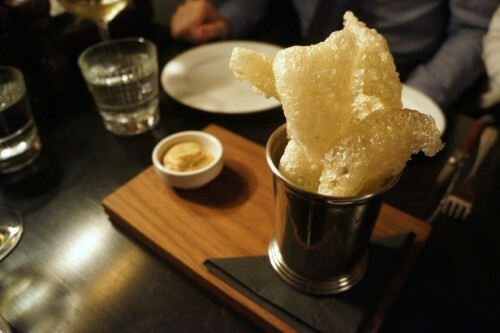 The last snack we shared was the Crispy Pig Skin & Pear Sauce ($7). It was another sweet and savoury combination but I definitely preferred the Devils on Horseback. This was decent but nothing particularly memorable. From the appetizers, we decided to try the Steak Tartare – Toad in a hole ($14). 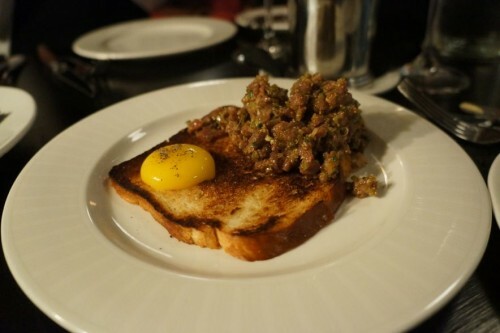 It was a really enjoyable tartare which was seasoned nicely. If you’re low on toast, the kitchen will send a few extra slices your way. 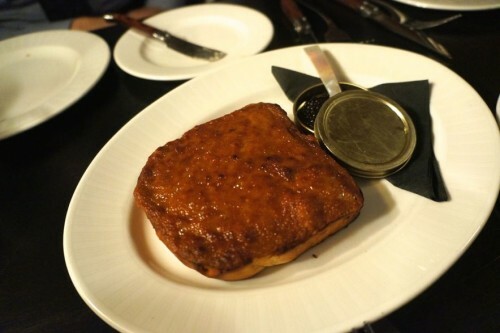 The other appetizer which caught our eye was the Welsh Rarebit – with Worcestershire caviar ($9). It was essentially an open-faced grilled cheese sandwich with a side of Worcestershire caviar. The ‘caviar’ was very interesting – as we placed it on the bubbling grilled cheese, it would instantaneously melt back into a sauce. Very tasty! Now, onto the main courses! First up was the Duck Confit – beets, puffed rice, potato terrine, pickled walnut ($26). The duck had a nice crisp skin and the meat was incredibly moist. Despite being a touch too salty, I still thought it was a great dish. The potato terrine and beets were a nice accompaniment, making it a very hearty dish. 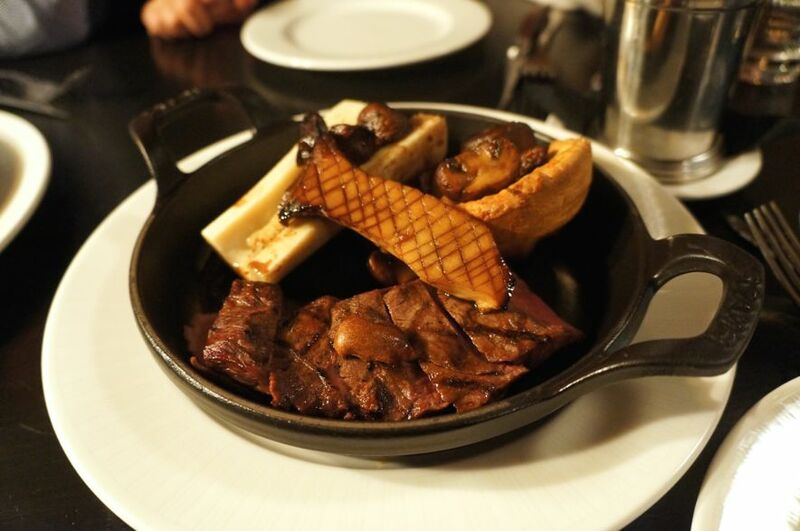 Up next was the Steak – king oyster mushroom, Yorkshire pudding, bone marrow, red wine sauce ($28). With the Yorkshire pudding and bone marrow, this was undoubtedly a rich dish but totally worth the calories. We scooped out a bit of bone marrow and melted it onto the steak, which was cooked to a perfect medium rare. This was a definite hit at the table. 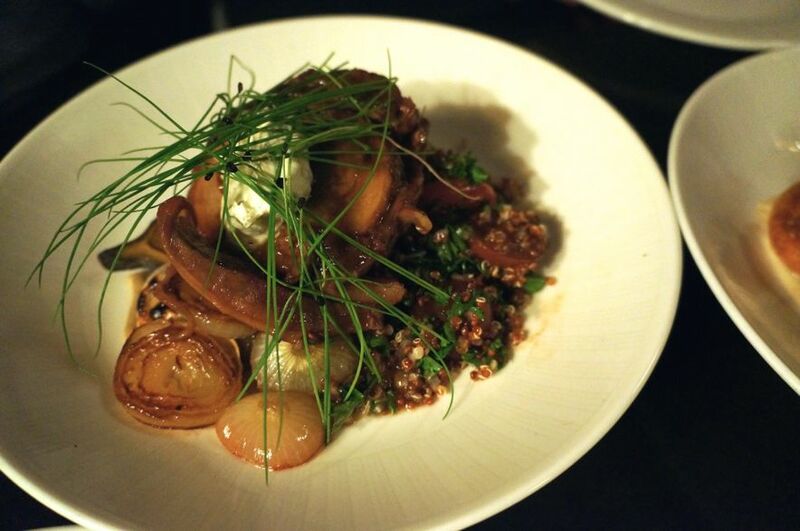 While I loved the steak, I thought the Lamb – cippolini onions, roast eggplant, red quinoa tabule, goat tzatziki ($24) was even better. When asking for recommendations, our server highly recommended the lamb since they do all the butchering in house. I loved each and every component of this dish. The lamb was cooked perfectly and I loved the pairing of it with the eggplant and soft cippolini onions. I particularly enjoyed the red quinoa tabule which made the otherwise heavy dish, much more balanced. If you see lamb on the menu, definitely order it! The last dish we shared was the Gnudi – chanterelles, black oyster mushrooms, cauliflower, black truffle ($24). After the fantastic meat dishes, I was a little letdown by this mushroom gnudi dish which arrived with four fried ricotta dumplings. They were essentially deep fried balls of pure cheese and just too heavy for my liking. Very intense! However, the rest of the dish was tasty. Overall, we had a great night at Peter Pan. With the exception of the gnudi, we all really enjoyed the food. The half priced wine was definitely a nice bonus, making for a more reasonably priced date night. I’m surprised this restaurant hasn’t gotten more buzz. It’s very underrated. I’d come back in a heartbeat!